The Nightmare Before Christmas is a 1993 stop motion fantasy film directed by Henry Selick and produced/co-written by Tim Burton. 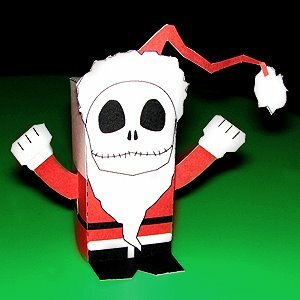 It tells the story of Jack Skellington, a being from "Halloween Town" who opens a portal to "Christmas Town"
Download the free PDF here and make your own Santa Jack! And here's Jack in his original suit. Toy-A-Day wishes everyone a Merry Christmas and a peaceful year ahead! Thanks so much! I'm drawing the Nightmare Characters in Resistant materials at school and this will be a big help. Another suggestion: The Mayor and the sleigh he uses. I am sure you don't remember a lowly commenter like myself, but I was with you from the begging until there was a... hiatus you could say in the toy making. But I would just like to tell you that I was just checking back in on some great blogs, like this one, and am more jolly than saint nik to see that the site is up and running again. Was there ever a second contest? yes i remember you and was wondering where has you been lately. nice to have you back! i'm in the process of planning a second contest and still working out the deatils. will keep everyone posted! Your creativity is truly inspirational!